This artist’s impression shows the Milky Way galaxy. 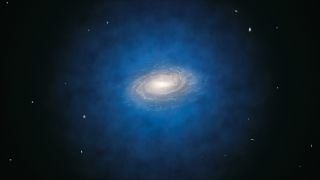 The blue halo of material surrounding the galaxy indicates the expected distribution of the mysterious dark matter, which was first introduced by astronomers to explain the rotation properties of the galaxy and is now also an essential ingredient in current theories of the formation and evolution of galaxies. A new study has found no trace of the mysterious substance known as dark matter around the sun, adding a twist to current theories, researchers say. Dark matter is one of the greatest cosmic mysteries of our time — an invisible, intangible material thought to make up five-sixths of all matter in the universe. Scientists currently think it is composed of a new type of particle, one that interacts normally with gravity but only very weakly with all the other known forces of the universe. As such, dark matter is detectable only via the gravitational pull it generates. Astronomers first proposed the existence of dark matter to explain why stars moved the way they did in the Milky Way. It was as if extra matter was present, exerting a gravitational pull that influenced the motions of the stars. "Our results contradict the currently accepted models — the mystery of dark matter has just become even more mysterious," said study lead author Christian Moni Bidin, an astronomer at the University of Concepción in Chile. The scientists used telescopes at the La Silla Observatory and the Las Campanas Observatory, both in Chile, to map the motions of more than 400 red giant stars up to 13,000 light-years from the sun. This helped calculate the mass of material in the vicinity of the sun, in a volume four times larger than ever considered before. "The amount of mass that we derive matches very well with what we see — stars, dust and gas — in the region around the sun," Moni Bidin said. "But this leaves no room for the extra material — dark matter — that we were expecting. Our calculations show that it should have shown up very clearly in our measurements. But it was just not there!" Dark matter models had predicted there should be about 0.9 to 2.2 pounds (0.4 to 1 kilograms) of dark matter in a volume the size of the Earth in the sun's part of the galaxy. However, these new findings suggest there is at most 0.15 pounds (70 grams) of dark matter in that volume in our part of the Milky Way galaxy. "Despite the new results, the Milky Way certainly rotates much faster than the visible matter alone can account for, so if dark matter is not present where we expected it, a new solution for the missing mass problem must be found," Moni Bidin said. An annotated artist's impression shows the expected distribution of dark matter around the Milky Way galaxy. It's possible that starlight passing through dark matter could scatter, creating a "halo" of light. The findings could explain why all attempts to detect dark matter in laboratories on Earth have failed so far — there is much less of it in the sun's neighborhood than expected. "Strictly speaking, the results do not say that dark matter does not exist — they only say it is not here," Moni Bidin told SPACE.com. "We have not proven that dark matter does not exist, and even if we do, at this point we cannot explain many other phenomena that today are explained only by dark matter." One alternative to dark matter is known as Modified Newtonian Dynamics, or MOND, which tweaks how gravity works at large scales to help explain the motions of stars and galaxies that researchers observe. However, "to my knowledge, MOND also would have expected a massive 'phantom disk' to appear in our study, so our results should contradict its expectations, too," Moni Bidin said. Future astronomical surveys, such as the European Space Agency's Gaia mission, could help shed further light on dark matter, Moni Bidin said. Gaia will collect data to reconstruct the movement of millions of stars. "Thus, we will be able to test the presence of dark matter in a wide region of the galaxy," he explained. The scientists will detail their findings in a future issue of the Astrophysical Journal.